Many said at the outset that supply would be an issue. There simply weren’t enough experienced, capable women to fill the seats. This hasn’t proved to be the case, with over 700 women newly appointed to boards of FTSE 350 companies. Without the efforts of all our stakeholders, many of the women recently appointed to FTSE boards, would still be waiting patiently in the wings for their rightful place at the top table. There are 25 women (9.8%) holding executive directorships in the FTSE 100 companies compared to 18 women (5.5%) in 2011, showing only a very modest gain. Companies are increasingly aware of the need to strengthen their own talent pipeline, particularly in the Executive layer just below board level, with many embarking on excellent programmes during the year to retain, promote and harness the skills of women. Britain needs to unleash the full extent of female talent. It is good for business, good for the UK economy and ensures our future competitive place in the global arena. Consultation findings from the 2011 Davies Review indicated the lack of female career role models acted as a barrier to women’s progression. The low number of successful female role models often adds to stereotypes and reinforces perceived difficulties in rising up the corporate ladder. Organisations are encouraged to shine a spotlight on their talented women and encourage them to share their career stories and tips for success with women coming along behind them. 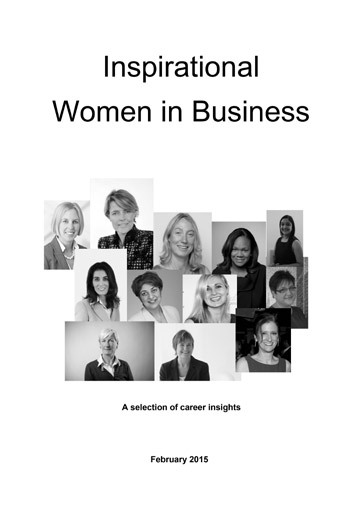 One such report Inspirational Women in Business, highlights a number of inspiring business women at different stages in their careers, their views on leadership and provides advice and guidance to those women aspiring to senior business positions. Organisations such as Cranfield University have profiled over 400 capable women through their 100 Women to Watch publications. KPMG are currently launching their extensive online database and profiling platform OnBoard for women ready to serve on British boards and Women on Boards UK, a specialist company focussed on developing women, now count nearly 10,000 aspiring women in their networks. 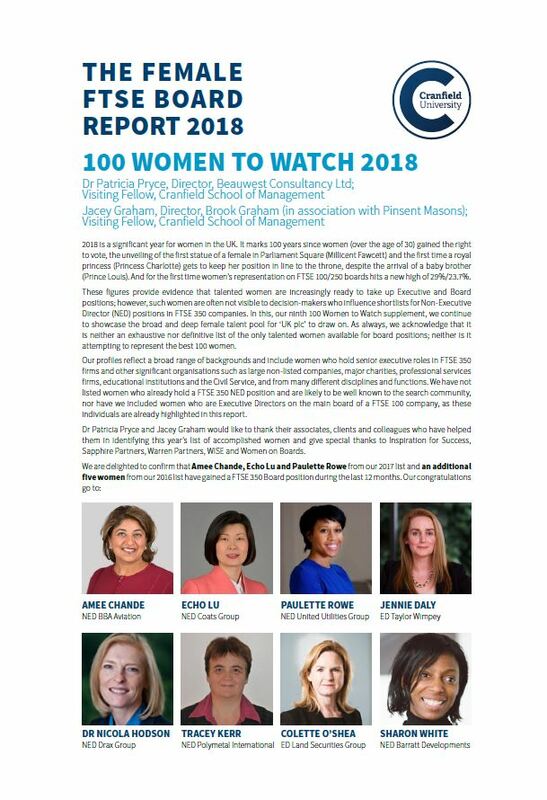 The Cranfield 100 Women to Watch supplement identifies 100 women who are currently or have recently been in executive positions on FTSE boards and other significant organisations, such as large non-listed companies, major charities or professional services. who in their opinion are poised and read for a board position. It is not an exhaustive or definitive list of the only talented women available for board positions; neither is it attempting to represent the best 100 women by dint of validated criteria; other lists do this in their respective fields. The aim with the supplement is to continue to highlight the broad and deep female talent pool for ‘UK plc’ to draw on, by showcasing different talent and, in so doing, to refute the myth that there is a limited supply of willing and able women to take on board-level accountability in UK listed companies. 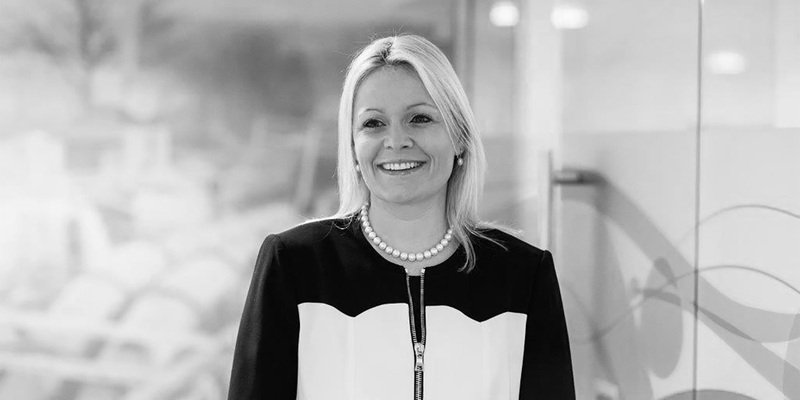 – Mairéad Nayager, Global Human resources Director, Diageo PLC.